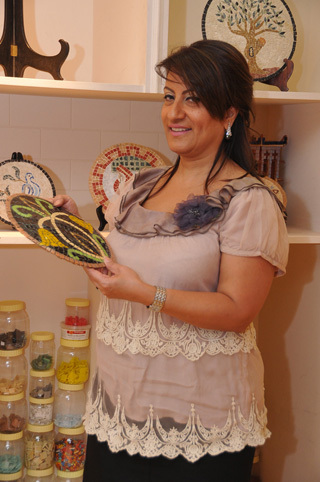 For general inquiries, to book your spot for a workshop or to make an order please contact: info@faizasaeedmosaic.com. For press inquiries, please contact Nada: nada@obaiandhill.com. Alternatively, please call +973 39937669 or +973 39699466 for more information. You can commission Faiza to design a customised piece to your specifications. This can be personalised with names, a theme, date and text. These can make for the perfect unique gift and are the perfect way to congratulate newlyweds, friends or new parents with a timeless gift that will be enjoyed forever. For commissions, please contact info@faizasaeedmosaic.com.